We’re excited to welcome you to our new blog – it’s been a long time coming! We look forward to sharing lots of informative, inspirational and entertaining content, and giveaways (like the one below! ), with you, our wonderful customers. That’s o.k., we’d love to share with you too! And now, even though we’ve already lined up lots of fun and informative content for you, we’d love to hear a bit about what you’d like to see us share here on our blog. After all, this is for you! And now for a fun kick-off event – YOU could be one of our lucky winners in our first Quilting Holiday Giveaway! Yes, you heard right, we’re kicking off our new blog with a giveaway. And YOU have numerous chances to win fabulous quilting presents! 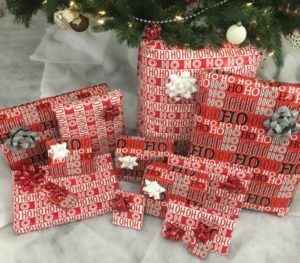 Some of the above presents were delivered by Santa Hobbs and some were delivered by fellow quilt industry companies – what’s inside each present, and who delivered them, will be revealed when the winners are announced. How do you enter to win the giveaway? 2. Enter your 2017 quilting goals in the comments* below by the deadline, January 5, 2017. Entry Example: My quilting goals for 2017 are to try three new patterns, and to complete three quilts, by year’s end. 3. Share this blog post and giveaway (using the social sharing icons below) on one or more social media channels using the hashtag #JoyOfQuilting – you just might receive our ‘lucky 13’ bonus present for doing so! This giveaway is open to ALL quilters age 18 and older. We’ll use a random number generator to randomly select 12 entries from the submitted comments* as our winners. Additionally, we’ll be scouring Facebook, Twitter, Instagram and Pinterest for your share of this giveaway (remember to use the hashtag #JoyOfQuilting). Then, on January 6, 2017, we’ll announce the 12 comment* winners, and one social sharing winner, and each winner will have 72 hours to claim his/her present. Be sure to check back on January 6, 2017 to see if you won! My quilting goals for 2017 would include to finish hand quilting our master bedroom quilt, make more sets of placemats, design and make more tablerunners, design and create at least 3 baby quilts, and finally finish hand quilting a lap quilt. The quilting goals I have for 2017 are to make a quilt for my two sons and my hubby, quilt a large quilt that is calling my name (begging) to be finished, and to make seasonal quilted table runners and toppers for my daughter-in-laws!! My quilting goals for 2017 are to use my pantovision tablet on my longarm with ease and begin to do quilting for others. Finish U.F.O’s-always tops on my list. But this is the year of -ME. Do what I want. Make quilts for ME. Go outside my comfort zone and try new techniques. I’m excited about your new blog. Please keep us informed about new products. My quilting goals for 2017 would be to get some of my UFO quilt tops quilted. Finish up my Mn quilt I started a few years ago, complete piecing myvred and white quilt and my Civil War Diary quilt. I always have high hope with the beginning of a new year! I love seeing different quilter’s works on your social media. It is one of my favorite things to see. I’d love to see more in depth discussions of the uses of your different battings in the future posts. Have a great New Year, Hobbs!! My goals in the New Year are to learn some new techniques like curved piecing, English paper piecing, and Sashiko embroidery. My goal for 2017 is to actually use the Quilters Planner effectively and finish more wips while keeping the start of new projects to a slightly more manageable level! My quilting goals this year is to finish an art quilt on the long arm. Then load charity quilts onto the long arm and with Hobbs batting and quilt lickty split! My quilting goal for 2017 is to learn to use the “new to me” vintage sewing machine that my boss gifted to me. I even have the card table that it sits in, so I need to learn to use it! My quilty goal for 2017 is to try out at least 3 or 4 new patterns. I strive to improve my free-motion quilting. My favorite part of quilting is when I give the quilt to whom ever I made it for ,,and seeing the joy on their face too!! My quilting goals for 2017 are to finish my UFO’s, all nine of them. Also, to finish each project as I go, not put it aside and start another. My 2017 goals are to quilt every top I make before end of year. I have 3 from 2016 that are still waiting for me. Teach my students at least 6 new patterns. Full year ahead get ready world. Go forth and sew. My goals for 2017 are to enter more quilt contests, make up several quilts I have designed and write the patterns to them. My quiling goals for 2017 are to finish several UFOs, start working on a Millefiori quilt (which means learning the process!) and become proficient at FMQ on my Bernina! Then there are the quilts that I need to make for the grandies! To make a wonderful rag quilt for my husband and finish a hand sewn quilt (grandmothers flower garden). The most important thing is to enjoy myself – no stressing. My quilting goals for 2017 are to finish several UFOs, start a Millefiore Quilt (which means learning the process) and learn and get proficient with FMQ on my Bernina. Also there are several quilts that I need to make for the grandies! I’m planning more quilting time for 2017! Hand Quilt the three quilts I had entered in shows last year that didn’t get completed because of a family emergency. My quilting goals are to finish at least 1 ufo a month. get my stash organized. make a landscape scene that has been in my head for about 7 years. My quilting goal for 2017 is to finish more quilts than in 2016. My quilting goal for 2017 are to complete 4 UFOs and three new quilts. My quilting goals for 2017 are to finish my New Hexagon quilt, and get my long arm set up again after my move. Have a whole roll of 80/20 waiting for the longarm ing to begin. My quilting goals for 2017 are to finish my black & white Bento Box, tostart la Passagaglia(sp?) and to sort my stash with an eye to actually using it! My quilting goal for 2017 is to sew some of my projects in waiting. I have many and just so you know I am a Hobbs batting girl been using it for the entire 16 years I have been quilting. I also only use your wool for my hand quilting. Love it! My quilting goals for 2017 are to actually quilt the 8 tops I made in 2016, to actually use my Tula Pink fabric in a project, and to improve my hand quilting! My quilting goals for 2017 include finishing the two throw sized quilt tops I have hanging on my sewing room door for far too long, and to finally make myself a tote bag out of one of the dozen or so patterns I have collected. My quilting goals for 2017 are to try and finish all of my lingering UFOs and work from my stash! My quilting goals for 2017 are to practice and improve my free motion quilting and to make a king size quilt for my bed. I would love to see quilt tips & tricks with some fun, easy patterns for gifts thrown in. My 2017 quilting goals are to seriously try to start and finish some of the many quilt kits I have and to make a dent in my stash of fabric. My 2017 Quilting goals are to make a feathered star quilt, try layering different battings to get different Quilting results, , do more original art quilts. My quilting goal for 2017 is to make at least 15 quilts to sell and 25 baby quilts to sell. In 2016 I made 5 quilts for my children and spouses and 11 quilts for my grandkiddos for Christmas. I also made 25 or so baby quilts to sell. My goal for 2017 is to make at least 15 quilts to sell and 25 baby quilts to sell. In 2016 I made 5 quilts for my children and spouses and 11 quilts for my grandkiddos for Christmas. I also made 25 or more baby quilts to sell. My 2017 goal is to make at least 15 quilts to sell and 25 baby quilts to sell. In 2106 I made 11 quilts for my children for birthdays and 11 quilts for my grandkiddos for Christmas. I also made 25 baby quilts to sell. My 2017 goals are to finish two quilts that have taken a couple years to make, for my daughter and son. Also I make larger lap quilts for dear friends and quilt them on my domestic machine. A time consuming process, filled with Love! My 2017 quilting goals are to finish all the tops my mom made before she passed away last October. So that I can give all the kids a quilt made by Nana,and I. My quilting goals for 2017 is to improve my skills. I did a few kids quilts before Christmas, for my great grandkids. They weren’t perfect but I hope to get better. My quilting goals for 2017 is to make for good to benefit those in need of a warm quilt. I hope to complete and donate a minimum of 10 adult quilts and 20 infant quilts. My goal for 2017 will be finishing my 50+ quilt tops. I got behind due to my Breast Cancer surgeries. Had 2 masses and 8 surgeries. I almost had to close down my company. Taught my hubby to sew so he helps out. We donate 50% of our lap quilts to hospitals and nursinghomes. Getting free batting g will help us get them quilted! My quilting goal for 2017 is to work on publishing patterns and get my next show quilt with amazing Hobbs will done! My quilting goals for 2017 are to get my many quilt tops out of the closet and onto the longarm. At least one a month all year as well as creating some more. I love Hobbs batting is my absolute favorite batting! My quilting goal of 2017 is to make a fabric-themed quilt (top…. hehehe) each month of the year. That, and to learn to use a sewing machine after 20 years of hand-piecing/ quilting. My 2017 quilting goals are to finish the applique quilt I am working on, to make a pieced quilt for my grandchild for graduation, make a wall hanging for a son, and to finish 8 different quilts that only need bindings. Guess I’d better get started. My 2017 quilting goals are finish my three children’s quilts, make myself a new bag and get started on various gifts. My quilting goals for 2017 include making 3 military service quilt tops, making a quilt for the 3 of my siblings whom I have not yet quilted for and my nieces and a great niece and nephew. Also, pillowcases for Sweet Dreams, a quilt guild outreach program and another outreach program. And, a throw for me. Thank you for helping make our quilts special. My quilting goals for 2017 are to quilt all the tops I have finished, about 25 of them! I love Hobbs 80/20! My 2017 quilting goals include making 5 new Improv quilts and finishing 2 quilts that are gifts. I also want to use fabric in my stash. I have a very ambitious goal to finish 10 quilts in 2017. A couple are original designs, one is hand appliqué and quilting, others are stash busters and for charity. My 2017 goals are to complete 3 canada day quilts as 2 of my grandchildren are born July 1 and complete 3 UFOs . My quilting goals for 2017 are to stitch more and give more. I intend on quilting my way through the wip pile. And id like to become less critical of my stitchings. Batt info and use interest me most. Fiber history, manufacture, special use, anything batt related. My quilting goals for 2017 are to finish all the UFOs on my APQResolution sheet as well as finish all of my cousin quilts. Thank goodness there is some overlap there! I’d love to see batting tips and tricks on your blog. My quilting goals for 2017 is to finish the quilt I promised my son for over a year now. Also get to do some baby quilts done for my grandbaby. My quilting goal is use my scrap basket til it’s empty.will probably take the whole year. My 2017 quilting goals are to finish at least 8 of my UFOs by year end. My quilting goal is to learn my new long arm and to quilt the 5 or 6 finished quilt tops and to continue to make quilts for our homeless shelter. I also want to share my love of quilting with others. One goal is to utilize (learn!!) the different rulers I have acquired over the past couple of years! My quilting goals for 2017 are to finish a quilt for each of my 12 grandchildren. I’m making one a month and giving them to them in their birthday month. Luckily i only have one month where i have two in the same month. Twins. My quilting goal for 2017 is to finish a quilt I started almost 4 years ago for my daughter and son-in-law. Life got in the way and now I’m determined to finish it (and soon). My quilting goals for 2017 are to make a quilt for myself. Every time I make a quilt it is for someone else. I also want to actually finish several UFP. I also want to keep learning. I am always finding out new or better ways to do things! #joyofquilting. I have leftovers from my church ministry to finish longarming, as I will get more soon, finish another 4 medium size gifts (start to finish), sit still long enough to finish a group crazy quilt hand project, & start and design a group pieced quilt, then quilt it. I love my long arm time, and go through lots of batting, so I would love, love love to be a winner of my favorite Hobbs Batting.thank you for your sweet opportunity. My quilting goals for 2017 are to finish at least 6 projects(tops) and quilt at least 3. My quilting goals for 2017 are to make memorable quilts for all of my family members. To get caught up on customer quilts!! My quilting goal for 2017 is to learn EQ7 and complete at least six projects. My quilting goals for 2017 are to make 2 baby quilts and table runner and enter one of them in the Winona County Fair. If I earn a ribbon I will be super excited. I would like to finish at least 2 projects that I have started. My quilting goals for 2017 include completing a Quiltworx paper pieced quilt and quilting it. I also plan to complete 5 UFO’s that are lurking in my quilting room! Seeing as it’s Canada’s 150th Birthday year, I hope to get the Canada Mystery by Cantik Batiks finished. Also need to finish my 365 Day Quilt Challence from 2016. There are also numerous quilts tops to be finished, at least 3 quilts to be hand quilted including my Dear Jane & 6 or 7 to be machine quilted!! My quilting goal for 2017 is to quilt up at least half of the 25 tops I have hanging in my closet!! My 2017 Quilting goal—–to make my FIRST quilt! We are moving back to Minnesota before July so my 2017 goals are to finish two quilts for a niece and nephew, made out of their Dad’s shirts. He was tragically killed in an accident a year ago and I always feel that a quilt brings comfort. I also have three twin size quilts for a niece and two nephews for their beds. Always lots of small projects like table runners and pillows. I love doing these things for others. I have made over 100 quilts and have given them all away.